98° are celebrating the 20th anniversary of their first single and album and, on October 13, will release their second Christmas album. The vocal quartet comprised of Nick Lachey, Drew Lachey, Justin Jeffre and Jeff Timmons who are renowned for signature R&B-tinged, four-part harmonies will release Let It Snow via UMe. It is their first new album in 4 years and a follow-up 18 years in the making to the now classic and platinum certified album This Christmas. The album, recorded at Sound Factory in Los Angeles, CA was produced by Andy and Thom Mak and executive produced by Grammy-nominated music, TV and film producer Adam Anders (Glee, Miley Cyrus, Selena Gomez, Backstreet Boys and the Jonas Brothers). 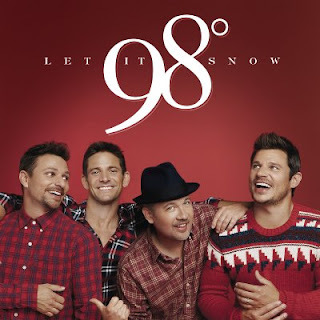 98° will support Let It Snow with the 98° at Christmas tour, a 31-city trek that starts November 10 in Larchwood, IA and concludes December 23 in Primm, NV. See the full list of dates below. Concert goers can expect a high-energy 98° show featuring holiday songs from their new album, as well as their beloved hits. VIP pre-sale tickets for the tour begins August 15, with general on sale everywhere Friday, August 18. Recording Let It Snow was an easy decision. "As a group, our favorite record, hands down, is [This Christmas]," says Drew. "We're proud of the music, the harmonies, the production. It's a Christmas record that every year people can put on and enjoy." "We have primarily a female audience, but we'll have guys come up to us and say, 'You know what? I love the Christmas album; my mom bought it for me.' It's bro code that the Christmas album's allowed," Timmons jokingly added. Let It Snow features 12 Christmas songs such as the title track, "Let It Snow," "What Christmas Means To Me," originally recorded by Stevie Wonder, "Little Saint Nick" and "Run Rudolph Run." Each track was personally selected by each member of the band. The full track listing and song premiere will be released in the coming weeks. 2017 also marks the 20th anniversary of the group's debut self-titled release. "It's a special year for us – it's the 20th anniversary of our first release on Motown Records," says Nick. "So, it just seemed like the perfect moment to revisit This Christmas and do a Volume Two." All four members have enjoyed other careers outside of music but love to get back into the studio and sing together. Nick appeared on TV shows both as an actor (The WB's Charmed and One Tree Hill ) and a host (VH-1's Big Morning Buzz Live). Drew was crowned season two winner of Dancing With the Stars, been on Broadway, and both brothers opened Lachey's Bar (A&E). Timmons joined members of Backstreet Boys and 'NSYNC for VH-1's Mission Man Band and Nick Carter's Sci-Fi feature, Dead Seven. Jeffre is involved in various media and cause related projects stemming from his foray into politics as a mayoral candidate of Cincinnati. 98° has sold over 10 million records worldwide, their four-million selling album, 98° and Rising (1998, Motown Records), spawned the top-5 favorites "Because of You," "I Do (Cherish You)," and "The Hardest Thing," while 2000's Revelation (Universal Records), which sold 2 million copies, peaked at number 2 on the Billboard 200 and yielded a trio of hits, "Give Me Just One Night (Una Noche)," "My Everything" and "The Way You Want Me To." The group has also collaborated on the chart-topping single, "Thank God I Found You," with Mariah Carey and Joe, and their collective idol, Stevie Wonder, on "True to Your Heart," for the 1998 animated Disney film, Mulan.